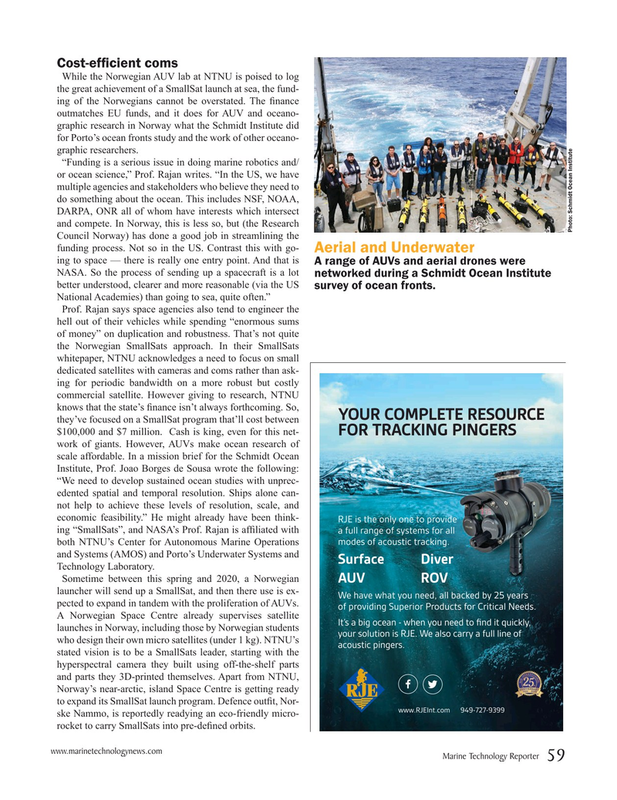 While the Norwegian AUV lab at NTNU is poised to log the great achievement of a SmallSat launch at sea, the fund- ing of the Norwegians cannot be overstated. The ? nance outmatches EU funds, and it does for AUV and oceano- graphic research in Norway what the Schmidt Institute did for Porto’s ocean fronts study and the work of other oceano- graphic researchers. NASA. So the process of sending up a spacecraft is a lot networked during a Schmidt Ocean Institute better understood, clearer and more reasonable (via the US survey of ocean fronts. We have what you need, all backed by 25 years pected to expand in tandem with the proliferation of AUVs. of providing Superior Products for Critical Needs. It’s a big ocean - when you need to ?nd it quickly, launches in Norway, including those by Norwegian students your solution is RJE. We also carry a full line of who design their own micro satellites (under 1 kg). NTNU’s acoustic pingers. Norway’s near-arctic, island Space Centre is getting ready to expand its SmallSat launch program. Defence out? t, Nor- www.RJEInt.com 949-727-9399 ske Nammo, is reportedly readying an eco-friendly micro- rocket to carry SmallSats into pre-de? ned orbits.